I recently came across a video on TED where Matt Cutts (http://www.ted.com/speakers/matt_cutts.html) an engineer from Google talked about his life changing experience by experimenting with a 30 day challenge of trying something new. This year has been one of the coldest winters for Bangalore. I wake up every day in the morning and look out through the balcony to judge how the day is going to be. This picture captures the view from the balcony overlooking the bamboo wind chime towards the new apartment building through a foggy outdoor. The neighborhood where I stay is newly developed. So there are quite a few construction projects happening around the area. A crane in one of the site is a "major attraction" for my 1.5 year old son, who is super excited to see the crane moving around while performing its job. Here is a view of the crane that can keep my son occupied for a quite long time. My mom loves gardening, especially flowers. So I had picked up some bit of that passion. I have tried to maintain a small garden of flowers that will enable me to practice my passion. This picture is of petunia flowers that are blooming at my balcony. Visited the "Madiwala Market" today to get some stuffs for home. This picture captures a snapshot of how the market would look to a passerby. This is a picture of my son Yash playing with his toy car. This is one of his favorite truck gifted to him by my brother/bhabi. Surprise was awaiting me today morning. As I went to my terrace I saw a kite (bird) sitting at the top of my water tank. I wanted to seize the opportunity for an awesome capture and rushed down to grab my camera. By the time I was back, the kite had opened up its wings. This picture was taken of a flying kite. Though my neighborhood mostly comprises of individual houses, it have a fair presence of high rise apartment buildings. This picture shows the view of few high rise buildings as seen from my terrace. It was spotted by my son two days back. Since then the butterfly has been a regular visitor to our balcony. This picture is taken when the butterfly was resting on one of the petunia plant. Our son Yash keeps exploring different places where he can get cozy and enjoy his tasks. This picture shows him in his new discovery, a bucket. He is seen playing a game of car race in my mobile phone. It’s an animal world. These are some of the toy animals of Yash, out of a bunch he has. He can identify all of them shown here and even name a few. While watching TV (NatGeo etc. ), he loves to pick up the one he sees on screen. Honestly, this is not what I normally do – sit back to enjoy a sunset in Bangalore. But I wanted to have it in my list of 30 photographs. So here comes a beautiful view of the sunset from my terrace (including a bird flying back home J). 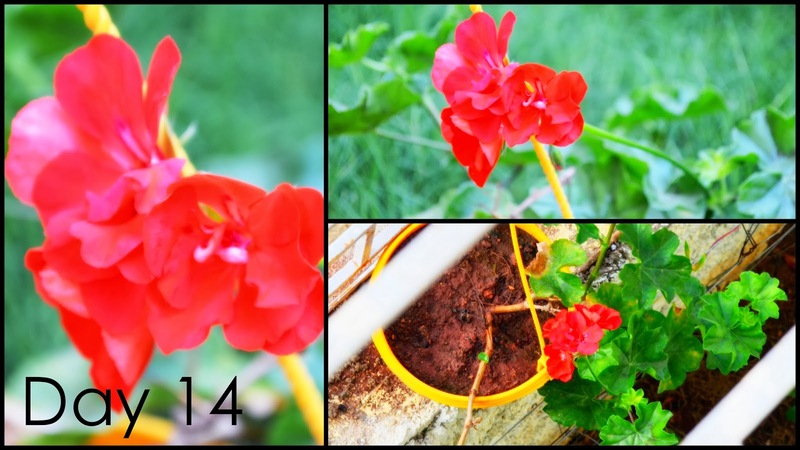 This geranium plant was nearly dying and with God’s grace somehow revived itself. Good to see it finally blooming with its beautiful bright red flowers. This is the same crane from day 2. The picture shows the crane still working hard late through night. The crane also got a partner J.
Amrita Vishwa Vidyapeetham’s Bangalore campus is just beside our layout. This picture is a night view of the college hostel in a long exposure image with few vehicles passing by through the layout. The construction workers of a nearby apartment building are being settled near my house. This picture shows the female members of the migrant workers waking up early in the morning and preparing meal for their family. Celebrating the republic day with this selective color picture of a beautiful yellow rose blooming in a bright sunny day. “Better late than never”. The packet of homemade special Bihu sweets finally arrived. Seen here are the Bihu sweets (Pitha: http://en.wikipedia.org/wiki/Pitha#In_Assam) beside a traditional Assamese headgear (Jaapi: http://en.wikipedia.org/wiki/Jaapi). “Play of Light and Shade”. This picture shows the magnified shadow of the staircase railing projected on the walls by the night lamp. Night view of the storage space of a construction site near my house. The marble slabs block almost half the approach road (seen in picture) to my house. The ghostly figure is a person inspecting the site. “Being Spiderman”. Can this spider bite convert me into powerful Spiderman? “With great power comes great responsibility” J. While my better half takes care of all the important stuff, I attempt to provide a helping hand to her by doing this – watering the plants J.
It’s a beautiful Saturday afternoon and the sky is shining bright. There are some moments when the sun plays hide-and-seek behind the clouds. This photograph is one of those moments! Kaikondrahalli Lake is a great story of lake conservation in Bangalore. This lake was revived through active efforts by responsible citizens. Here is a picture of a beautiful sunset as seen beside the lake. This is one of the lights purchased during this year’s Diwali. It is still hanging on our balcony and makes for a warm ambiance at times. Look who came visiting today – a baby “Praying Mantis”. It is praying to grow up as a strong and successful predator. "There are two ways of spreading light: to be the candle or the mirror that reflects it." - Edith Wharton. Lighted a candle today to feel both the darkness and the light at the same time. There are times when our son is deep in sleep by the time I leave for office, and we have to wait until the evening to bully each other when I am back from office. Lovely picture of our son deep in sleep and thanking my better half for helping me schedule my time. 30/30 – It’s all done and time to harvest, “Quite literally actually J”. Traveling has been one of my passions I have kept alive. I made sure never to miss a chance to see new places whenever an opportunity arises. I have not been a globe trekker (as those opportunities are hard to come by :-) but have seen quite a few places in India. India is a world in itself, a country so big with cultural contrast so sharp that I sometimes wonder it is magical that this country is still so beautifully bonded together. It reminds me of those words I have studied in school – “Unity in Diversity”, so true for this country. I was born in Assam, a state in the north-eastern part of my country India. It is one of the seven sisters (as they are sometimes called) of the north-east. North-east is a place which most people do not visit, or do not get a chance. Being born there, I had the advantage to grow in a culture so unique and different. I traveled to Arunachal Pradesh (Nirjuli, Itanagar) for my education and studied in a college situated in a valley between mountains and with a beautiful river at my backdrop. The college had students from all the seven sisters and also from all over India. This unique mixed cultural experience was enriching! Moving to Uttar Pradesh (Kanpur) for my higher studies was a cultural shift. The Hindi heartland in the northern part of India is surrounded by 9 states (in today’s count). Being the guy with scholarships now, exploring places was much more affordable :-). I finally moved to southern state of India, Karnataka, for my job. Bangalore has been my “Den” since then. It has given me a chance to explore most of south India. 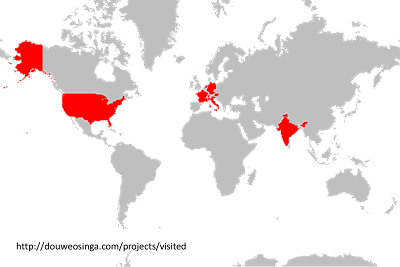 Here is a chart of the places I have visited. It will be easier to list down the states I have not formally stepped in (as I have passed them during travel to some other states). Working in a global conglomerate comes with its own advantages, some amount of global travel. My globetrotting have been limited to only few countries including United States and 6 European Countries (Austria, Germany, Netherlands, Switzerland, Italy and France). Austria was on official trip when I explored its neighbors. I actually wanted to list down my top 10 picks among the places I have visited. Every place I have visited is special and I have returned back with some special memories. I would like to exclude places I have lived in, as they will weigh down the others with emotions. I cherish the travel which has some of the strongest sweet memories, more than just the beauty of the place. My list might be a reflection of the same. I know I have missed many, but unfortunately ten was what I wanted the limit to be. Hopefully many more great travel experiences are coming my way. Shopping, everybody loves it…. Most of the joy comes from the fact that something new is added to our list of possessions. But, during my visit to Austria I came across a joy of experiencing something else. When I landed in Rum, I wanted to explore the places around where I was staying. One of the good way (or the relevant way) to explore a town and meet people is to check out its eateries. So I went to the hotel reception desk for enquiring about the good restaurants close-by. She informed that the closest is a McDonald’s that is a few block’s walk down the street, the other options are a few kms away. McD is something I can live with for a few snack, time-to-time when I am hungry, and thus decided to check it out. McD was just few walk down the street. It was quite crowded when compared to the number of people in the streets. Checked out the menu and ordered something. My vegetarian friends had some tough time ordering as there were very few vegie options (unlike India) and also there was this BIG language problem (Austrians speak German). They finally managed to grab something and when the stomach stopped screaming, we decided to check the place around. Come Sunday and we were outside the Metro shop just after finishing our breakfast. Surprise was awaiting us there when we saw – “The Metro store was closed”. We soon realized that all (well should I say most) shops remains closed on Sunday in Austria. But more surprises were awaiting us – we turned around to look at the Metro parking space and it has transformed completely. The whole parking was filled with what looked like “Hawker” stalls. It was something that was not present the other day we visited here. Pleasantly surprised we decided to explore. Over the next weekend when we visited Innsbruck and roamed around the popular tourist shops we figured out that the prices of items in the Sunday market at Rum is much less then what has been sold in other markets. But they are used items too though. Henceforth, the market place became a favorite hangout place for us every Sunday, not just it was priced right, but the variety of items there was mind boggling. We typically spend a lot of time looking around, spending more time exploring things that we have never seen before. The whole experience was culturally enriching, meeting common people (old and young), and knowing their culture/dress/art form. Some sellers there would convert to shoppers as the day pass by. Quite fun to hang out and watch. Some of the unique items on sale that I remember: Old worn out door knobs, deer horns beautifully decorated on a wooden plaque, one big garden statue, guitars and bike models, African wooden arts, Arabic artwork with gold colored carvings, skating and surfing boots, fishing rod and nets, a bike model made of cane, dried meat, old Olympic medals, badges, old swords, silverwares, antique brass utensils, and many more…. The things that attracted me most there was the antiques as well as the things that are very traditional to Austria. I zeroed in on an Austrian beer mug with lovely Tyrolian artwork of some famous historical monuments. The colors were beautiful, bright and traditional. I was able to get a good bargain (well that’s what I believed) and grabbed it. To be doubly sure that I am collecting the right stuff I checked with my colleague in office about the things that can be collected as a memento from Austria. The inputs I received was, “Pick some beer/wine, they are famous here”. I wanted something else, they said – “Wooden items are good here, you can grab some”. With their inputs in mind I started exploring the market again. A wooden plaque took my attention. It consisted of beautiful 3D carvings (looked like metal) at the center with the image of a Tyrolian soldier in three different moods. I checked for the price and the person agreed to give me a good deal if I buy all of them, three pieces in total. I was apprehensive to get all of them, so I decided to move on. But as I started exploring the other stalls, the plaque stuck to my mind. As one typical shopper I went back many time to the same stall, hesitated, avoided buying it, and finally decided – let’s buy it. I paid him the money and put the prized possession in my bag. My wife Prantika visited me in Austria during my last week stay. I made it a point to take her too to visit the market, to give her a feel of it. She liked some artwork from Africa and we purchased that too. When I finally left Austria, I came back with some great memories to cherish back home. “Culture is the sum of all the forms of art, of love, and of thought, which, in the coarse or centuries, have enabled man to be less enslaved” – André Malraux. Paris - City of Love, Light's and Dreams. Dream destination of many, the name itself sounds excitement. Paris is also the most widely visited place in the world. So when I got a change to visit Austria on an official trip, I made it a point that I do visit Paris. Since budget was also a constraint, a to-and-fro journey did not make sense. 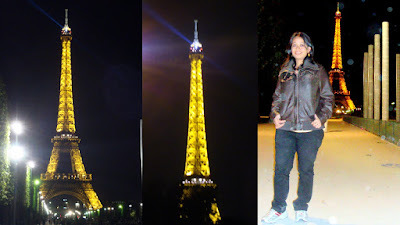 Visit to Paris was hence planned to happen on our return trip, as a stopover before we fly back to India. Once I reached Austria, the sheer beauty of the country bowled me over. The view of the Alp’s and its snow clad peaks were heavenly. The beauty of Austria though did not divert attention out of the planned trip to Paris. I had to book the train tickets as well as the accommodation well in advance to get a good deal. The return dates were already finalized (same as to India) and the train ticket has to be booked for the fixed dates only. Over the first weekend went to the tickets booking counter of OBB (http://www.oebb.at/en/) and booked the tickets to Paris (~87 euro per person). Österreichische Bundesbahnen or ÖBB is the national railways system of Austria run by the federal government. Once the tickets were booked the responsibility of accommodation was delegated to one of my colleague, who took care of it. Enjoyed my days of stay in Austria, and finally Prantika joined me in May. Took some time off from office and showed her around. To our luck the weather was with us (bright sunny days as opposed to intermediate showerwhich was common during that time of the year in Austria). It was finally time to say good bye to Austria, and head towards Paris; and back to India. There is no direct train to Paris from Innsbruck and a connecting train via Munich was the only choice. The train leaves Munich @ 10:45 pm night and we had to plan out things accordingly. My experience with European trains was that it hardly gets delayed or cancelled, so I suggested a train to Munich that reaches 15 minutes before the connecting train leaves to Paris. But my colleagues were not ready to take that chances and we left Innsbruck at 6:30 pm, well ahead of time. The train reached Munich @ 8:30 pm giving us more than 2 hours of free time at hand. There was nothing much to do and we decide to finish our dinner. I wasn’t feeling much hungry and neither was Prantika. So we went to “Burger King” to grab some snacks. Bought some water and headed back to the platform. The train arrived 15 minutes before its departure and we quickly settled down at our seats. They were 6 of them, 3 facing each other, no fall back arrangement and wasn’t very cozy for a night journey. The arrangements also did not allow sufficient space to accommodate the large luggage we were carrying on our way back home J. Somehow managed to get everything in and when it was time the train started on its journey to Paris. I usually can sleep almost anywhere and had no issues in the train too. It seemed not the case for everyone else. I woke up in the morning when others were discussing how I was having a nice sleep and everyone else struggled. The train was scheduled to reach Paris @ 9:30 am and we got a chance to see France on the way. There are of course no mountains to be seen now. It was nice journey through farmlands, greenery and small towns. The train reached Paris on time. We rented a cab a headed straight to the hostel where we have booked a room for our night stay. Paris was just planned for an overnight stay, and we have to catch the early morning flight the next day. With such a less time in hand, we decided to make it a focused one. 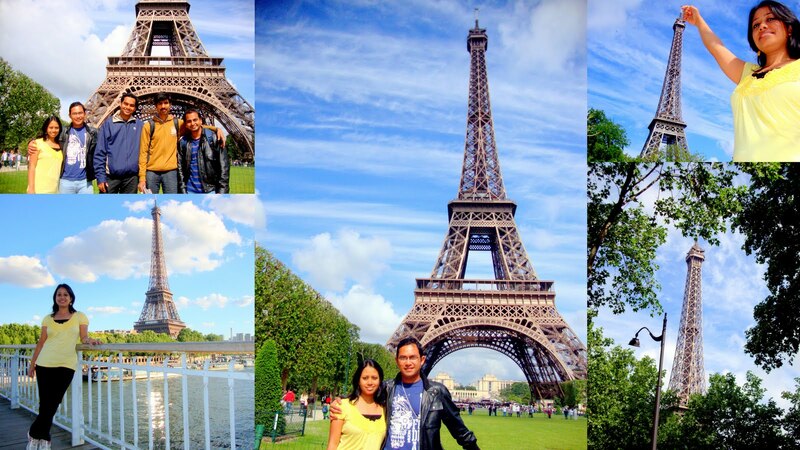 Like everyone who visits Paris, we decided to head straight to Eiffel tower. With few hours in hand we quickly got freshened up and headed out to explore the city. Eiffel tower was at a walking distance from where we stayed. As soon as we hit the street, I saw history staring at me from everywhere. The beautiful city architecture amazed me. 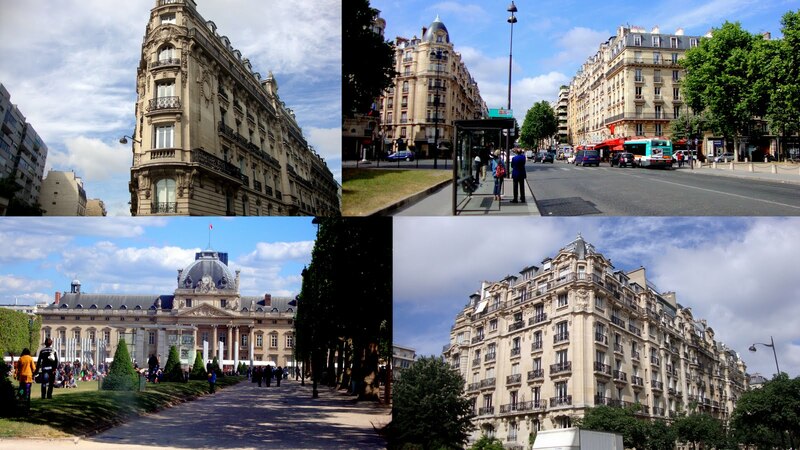 Almost all of the buildings, in every street I walked had loads of beautiful architecture built in it. Everything seemed to have been built just yesterday, just to welcome us. The Eiffel tower was nowhere to be seen (surprising for such a tall structure) and we kept following the map. We reached an open street and there was the Eiffel tower staring at us from top of the trees. It looked beautiful. We wanted to go to the top of the tower, but looking at the length of the queue, we decided otherwise. With little time in hand, we decided to move on. Crossed the street and then took the bridge over river Seine. It is a major river and commercial waterway. Saw many boats ferrying tourists. On the other side of the river were the museum and an Esplanade (open space). It had a great view of the Eiffel tower, as seen besides the river. The Paris skyline and its beautiful buildings beside the tower looked beautiful. 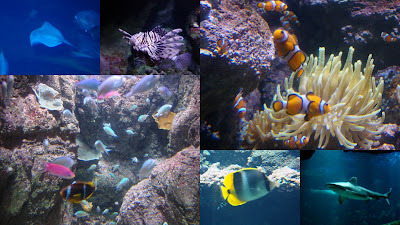 The next plan was to see the Paris aquarium (http://www.cineaqua.com/EN/index.html), as recommended by one of my colleague. The aquarium is just besides the esplanade, situated underground. The person in the counter informed that it will take ~ 2 hours to see it completely. As it was almost lunchtime, we took the tickets and started hunting for a restaurant. Settled into a Chinese restaurant and had a good lunch, trying out some new dishes. After the food, we were ready to explore the world of fishes. The aquarium had different sections for Pacific and Atlantic species. The things I loved most were the beautifully colored fishes besides the coral reef (the ones I typically see in discovery channels only). Another star attraction was the shark tank. The huge tank was filled with many sharks swimming besides other species, including stingrays. Some kids were having some great time, getting extremely excited when the shark swims by. There was supposed to be a movie show later on the day, which we skipped. Arc De Triomphe is another famous monument in Paris. It stands in the centre of Place Charles de Gaull (large road junctions). The Arc de Triomphe honors’ those who fought and died for France in the French Revolutionary and the Napoleonic Wars, with the names of all French victories and generals inscribed on its inner and outer surfaces. 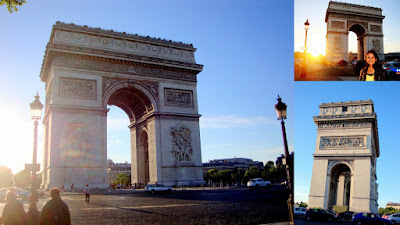 The Triumphal Arch is approximately 30-45 minutes’ walk from the Eiffel Tower. The walk is through the streets with the architecturally rich buildings. The walk was long and tiring after the busy day. But the excitement of the beauty let me forget everything. When we reached there the sun was touching the horizon. The Arch reminded me of India Gate, which also symbolizes bravery and victory. Many of the big streets meet the Arch at the centre (reminding me of Connaught place – Delhi). The streets were huge and there is a underpass leading to the Arch. The most amazing part was the traffic – it was quite chaotic with cars crossing each other at amazing precision (same as we do in BangaloreJ ). There were large pathways for pedestrians and lots of places to sit. I sat there waiting for the sun to set, and to have one special snap captured. The sun started to sink below the horizon and the sky felt warm. I captured one last snap of the Arch. We walked back towards the tower. Darkness started to cover Paris and we saw the tower getting lightened up. We decided to finish our dinner at an Indian restaurant we saw on the way and walk back to see the tower when its fully enlightened. The dinner was good, some Indian food at Paris. After the dinner we started our leisurely walk back to the tower. The tower was fully glowing by then. Bright yellow lights magnified the beauty of the tower. A bright flashlight at the top of the tower directed the focused light everywhere around Paris. After we spent some time there it was time to head back to the hotel. As soon as we lay on the bed, deep sleep took over us. We woke up early in the morning next day & quickly freshened up. The cab came to pick us up at 5:30 am for the airport. Had a last look at the city. Paris with more than few hundred places to see we just got a flavor of this amazing place. Reached the airport on time and walked towards the check-in counter. Just halfway stopped for a moment, looked back and said bye to Paris. Thursday, 17th March 2011: Its lunch time in office and Marc (my colleague working in GE Jenbacher Austria) and I was talking about the beautiful weather. He suddenly proposed we should go for a hiking trip on the mountains near his home; and I readily agreed. We decided to do it this coming Sunday. I informed my India colleagues about this plan and they also jumped in. So we were ready for some real action for Sunday. Sunday, 20th March 2011: It was a bright Sunday morning and I got quickly freshened up, finished my morning duties, and headed for the breakfast. To stay afresh until afternoon, I filled up my stomach completely. I filled my backpack with some eatables and fluid for the trek. All of us got together and moved towards the railway station. Informed Marc when we boarded the train to Jenbach. Jenbach is ~ 25 minutes of train ride from Rum. Train ride from Rum to Jenbach is really scenic with great view of the Alps. You can see the Schloss Tratzberg castle just before reaching Jenbach. When we reached the station, Marc was already waiting for us. We jumped into Marc’s car and started our journey to Achensee Lake. It was around 15 minutes ride through a curving road. The Achensee is a lake north of Jenbach in Tyrol, Austria. Marc parked his car at his home and we took a walk down to the lake. It was breathtaking view of the lake between the mountains. We also saw the railway station for Achenseebahn (http://www.achenseebahn.at/en/home.html). Achenseebahn is operational during summer (starting in May) which carries passengers from Jenbach railway station until the lake by a steam engine driven coach. After walking few distance on the tar road, we moved towards the hiking trail. It was just beginning of our trek uphill and the trail was already covered with snow. This gave an indication of what awaited us ahead. The snow was hard and walking on it was not very difficult, but fun. As we started moving upwards, the views started getting better. We started getting full view of the lake, which looked much bigger and much blue from this height. We kept walking with some brisk breaks, regaining our energy, and also capturing the moments in our camera. It was clear blue sky and the lake looked beautiful between the snow clad mountains. After some time, we were completely surrounded by snow. The route had marks of deer foot on the snow, suggesting their presence in those mountains. Marc took us to a place where we got the most awesome view of the lake. There were many people now at the peak, most of who came there for skiing. There was a ropeway which also carried tourist to the peak, passing by the awesome views of the Alps. Everything was beautiful everywhere, and took some time out to enjoy the view. We were feeling really hungry now. There was a restaurant at the top and we quickly settled in. it was quite sunny now and we took one table out in the open, with great view of the snow clad mountains in front of us. Time to grab some food, and we started gulping in. Marc informed that we will be taking a different route on our way back. The hike has already been a hit for us and we were hoping for some even better scenery on our way back. We took a short break and then continued on our descent journey. The lake started to show up, reminding us of its beautiful presence. The snow started reducing and walking became much easier. The descent was quick and we were soon walking beside Acehnese Lake. Few of us ran towards the lake to get a feel of its icy cold water. Took a last view of the beautiful lake and joined Marc to the return journey to Jenbach railway station in his car. We all thanked Marc for the great hiking experience. It was almost dark by the time we reached out hotel. My feet felt numb and a hot shower was what I was craving for. After the nice shower jumped into my hotel bed to browse through the memories captured in my camera. What a day, something to remember forever.